This property is immediately adjacent to the northern boundary of the Pioneer Square Preservation District and is associated with two downtown developmental eras. It is directly associated with the period of reconstruction and commercial development (1889-1902) that took place during the decade after 64 blocks of commercial and waterfront industrial buildings were destroyed by fire. While the new commercial district remained fixed within five blocks of Yesler Way and First Avenue, substantial commercial construction gravitated further north along First and Second Avenues and toward the well-established residential district. None of the older residential properties and very few intact commercial properties (located outside the Pioneer Square Preservation District) dating from this era remain within the downtown commercial core. This property is also associated with the early twentieth century era (1920-1930) when the modern downtown commercial district was fully established as additional high-rise commercial buildings were built. The economic prosperity of the 1920s stimulated the development of numerous major high-rise commercial buildings, as well as smaller-scale bank and specialty retail stores, major hotels including apartment hotels, club buildings and entertainment facilities designed by leading local architects. During this era, the use of private automobiles changed the way downtown Seattle functioned. Surface parking lots – many of which included a small gas station building - became a part of the commercial core or were located nearby on its periphery. By mid-1920s, large parking garages – some that could store hundreds of automobiles – were a lucrative and essential part of downtown commerce. Originally designed and constructed for John Cort, a pioneering theater entrepreneur whose civic lobbying succeeding in extending the city’s official entertainment district north of Yesler Way to Cherry Street. Cort established the Northwest Theatrical Association, a regional booking organization – also known as the Cort Circuit, which had controlling interests in thirty-seven theaters in several states by 1904. Eventually Cort owned some 200 theaters coast-to-coast, including the John Cort Theater in the NYC theater district. The Grand Opera House was designed by Seattle architect Edwin W. Houghton, who immerged as a leading designer of theaters throughout the Pacific Northwest, including many others built for John Cort. The opera house was constructed between 1898-1900 near the highly successful Seattle Theater, owned by another early theater entrepreneur John Considine, at Third Avenue and Cherry Street. The basement level was finished first and initially used as a variety and beer hall known as the Palm Gardens. The opera house included a 30’ deep by 72’ wide stage, two tiers of boxes (six to each side of the proscenium, a balcony and well-appointed orchestra level seating that could accommodate 2,200 people. It included a highly ornate interior with gilt plaster and mural decorations and was considered the city’s leading theater. The adjacent St. Charles/Rector Hotel was constructed in 1912-13 and designed to be interconnected to the opera house at the balcony level. The opera house was extensively damaged by fire in 1906 and 1916. By the time of the second fire the center of entertainment district had moved further north and nearer Third Avenue and University Street where several modern theater houses had been built, including: the Majestic, Pantages and Coliseum. 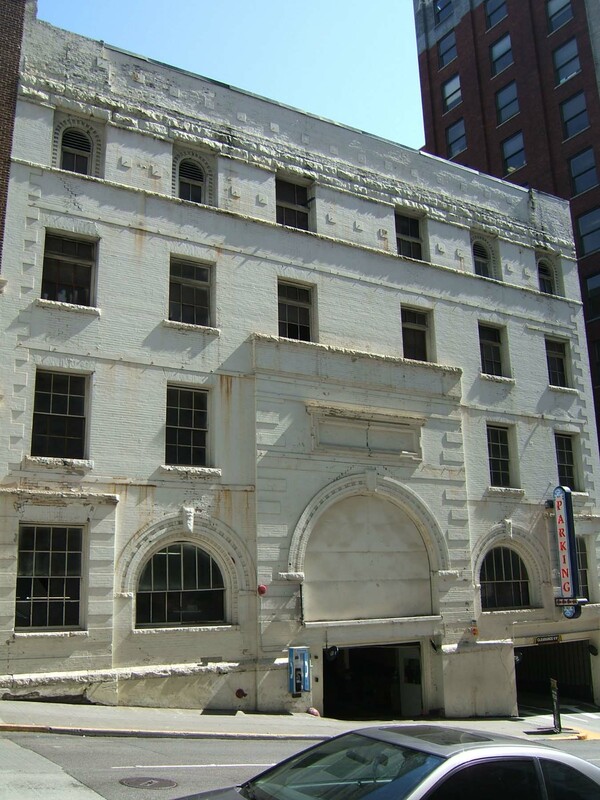 The building remained vacant and unused for several years until, in March 1923, it was announced that it would be converted by new owners (Victor Elfendal and W.W. Scrubby) to be used as a parking garage at a cost of $39,000. The notable Seattle architecture firm of Schack, Young and Myers was responsible for the design of the garage conversion. Schack, Young and Myers were a prolific firm credited with numerous commercial, residential and institutional projects during this era, including other transportation and auto-related facilities including the Sunset Motor Car dealership (Myers, 1917-18, destroyed) and the Grand Central Garage (719 4th Avenue, 1919). This is a relatively intact and early example of a somewhat uncommon but important downtown property type: the commercial parking garage. Other intact downtown garage buildings include: Donohoe Garage (1907 3rd Avenue, 1921 – altered interior); Grand Central Garage (719 4th Avenue, 1919); Second Avenue (Northwest Building Company) Garage (1915 2nd Avenue, 1926); and the White Garage (1915 3rd Avenue – altered interior, 1928). This is also a partially intact example of a highly uncommon downtown property type: opera house. There are no other extant downtown buildings that date from the post-fire reconstruction and development era that were initially designed and constructed to serve auditorium or theater purposes The oldest extant downtown theater is the Moore Theater (1907), also designed by Edwin W. Houghton. Located mid-block on the south side of Cherry Street between Second and Third Avenues, this five-story concrete and brick masonry building was designed and served as an opera house and theater from c.1898 until the interior was gutted by a fire in 1916. It was converted to a parking garage in 1923 and continues to serve this function. The brick masonry structure includes a foundation and basement level and measures 77’ x 120 ft. Despite significant changes to the façade, some original exterior historic building fabric and features remain in place. The original red brick cladding with ornamental quoins has been painted white as have extant portions of original sandstone trim including; the prominent former entry vestibule arch, the arched openings with keystones at the second floor level windows, the upper floor level window sills and watertable. Painted original sandstone trim also accentuates the former name plaque above the entry vestibule arch and the cap of the central raised entry bay. All of the original window openings remain in place including the four of the original six arched openings at the fifth floor level. When the gutted building was converted to a parking garage the two large openings at the first floor level were created and a former door opening to the ticket booth (at the east end of the second floor level) was made into a window opening. In order to create the garage entry and exit way openings the façade was drastically altered by the enclosure of the central entry vestibule and elimination of the entry stairway, which reportedly was accented by Vermont blue marble. The converted garage retained original raised corner parapets and a prominent cornice, which no longer remain in place. Industrial steel sash windows that were installed for the garage use remain in place. No original historic opera house interior building features or finishes remain in place.